Our new start/finish home beginning in 2018 will be at Cave and Basin National Historic Site. It’s a beautiful venue and we’re excited to be the first running race to ever take place there. Thank you to Parks Canada for welcoming us with open arms. We will still be providing you with a post race lunch and we’ll also have a beer truck! All route maps and descriptions have been updated. Leg 5 has been updated as of September 4 and is different from our original plan due to wildlife concerns from Parks. Please note that leg 4 & 5 are still subject to slight distance changes and will be updated after a GPS measure on September 7. The goal is to have the full course equal 42.2 km and make for a challenging marathon for our solo runners. There will be an aid station (water only) on legs 1, 2 & 4. The Ekiden route is always subject to last minute change due to environmental or wildlife issues. Parks Canada has implemented a new flag system when identifying potential wildlife risk. Red flag: wildlife are present and there is a high risk of conflict (i.e. : within 100m of the race route). Depending on the timing of a red flag, it could result in a re-route (using one of the other legs of the race) or a delay. If this occurs, race organizers will give runners as much notice as possible. Due to the nature of Ekiden having five legs to work with, it is unlikely that wildlife would force a complete closure of any one leg. If you see wildlife on the course, report it to a nearby volunteer or race official. If you have your cell phone and are not near a race official/volunteer then you can call Banff dispatch at 403-762-1470 and identify yourself as an Ekiden participant. They will notify us by radio. The lengths of Ekiden can vary greatly, but our Ekiden covers 42.195 km, a full marathon distance with five relay runners covering various distances. The new solo options comes with a couple of conditions. There will be a cut off time for each leg (listed as time of day below) with an overall cut off time of 4 1/2 hours. This is to stay within our permit guidelines and it makes for a great challenge! Along with the aid stations on legs 1, 2 and 4 there will be a station just for solo runners each time you pass through the start/finish chute with water, electrolyte drink, gels and some food choices. When you register for the solo race please familiarize yourself with the general race rules (bottom of this page) and the cut off times. Race package pick up will be at Stride’s Running Store Marda Loop (3558 Garrison Gate SW) on Wednesday October 16 from 4:00 – 7:00. Packages can be picked up at Stride’s Fish Creek (1119, 380 Canyon Meadows Dr. S.E.) on Thursday, October 17 or Friday, October 18 during regular business hours by request only. You must request south store pick up by 7:00 p.m. on Wednesday and any unclaimed packages left at Fish Creek will not be transported to Banff. Packages for out of town teams will be available for pick up on race morning at Cave and Basin beginning at 8:30. 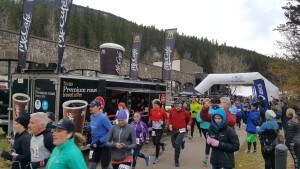 Each leg starts and finishes at the Cave and Basin Historic Site, 311 Cave Ave, Banff. Race starts at 10am for teams and solo runners. Check in begins at 8:30 a.m. Please note, only runners doing leg one and solo runners will be allowed to check in before 9:30. There is parking at Cave and Basin. Parks Canada requires all visitors bringing a vehicle into the park to have a park pass. For information on prices and purchasing a pass please click here. Entry fee to Cave and Basin is also required and will be included with your entry fee (five entries per team). Please read through our information package for all of the information you need prior to the race.